At the end of a year, it is enjoyable to pause and to reflect upon the events of the past 12 months. Although the holiday season is a busy time, I was able to take some time to relax and think back; I would like to share with you my retrospective. And then, I will give you a little hint of what I have planned for 2015. A highlight of 2014 was my exhibition. Exhibiting Schwalm whitework, and doing so, keeping a rich tradition alive, has always been a goal of mine. I am proud to have now mounted two exhibitions, and happy to have a dedicated space to display this needle art. I always look forward to welcoming visitors! 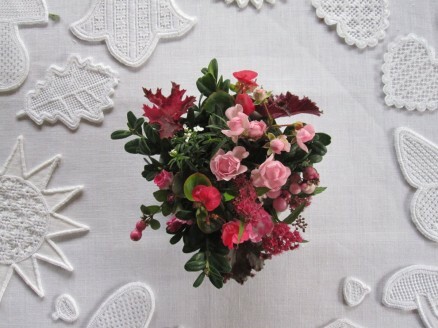 In 2014, I chose monthly small projects, precursors of true Schwalm whitework, to provide a unifying theme for my blog. Through these small projects, I was able to teach how to use filling patterns effectively in different shapes. In addition, I introduced many different filling patterns; I wrote about the Schwalm costumes and traditional craftsmanship, and about the materials and equipment used in Schwalm whitework; and I shared valuable tips about Schwalm designs. I worked hard to keep my blog interesting for you, my dear readers. Next year, for my blog, I will continue to build on the foundation I have established. However, the projects will become somewhat more elaborate. And I am thinking of an “ideas” workshop through which I will try to motivate and inspire you to create your own individual whitework. I also begin to work on a new and big exhibition of Schwalm whitework. I envision many themes and I have a lot of ideas for pretty new designs. I hope to see the project to fruition — perhaps by Autumn 2015, but Autumn 2016 might be more realistic. Rest assured, you will read about all of these right here! In January I will take a break from blogging, but will be back in February. For now, I wish you all the best for the coming year; take much pleasure in Schwalm whitework and enjoy each and every stitch! 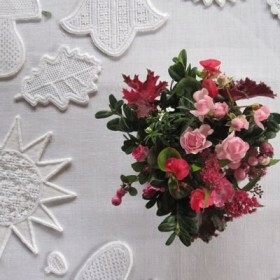 I am really loving the white work I am doing at present and lot of thanks to you and your blog. es freut mich sehr, dass meine Aussstellung ein wenig dazu beigetragen hat, das die Damen Ihres Stickkreises jetzt diese schöne Technik auch ausüben wollen. Ich wünsche allen viel Spaß dabei.